This will be my last post as a 28-year old. My birthday is next week, and I'm going to be in a remote location out on the open seas (that's actually true). And while the thought of having no cell phone and internet for a few days gives me a minor panic attack, I actually think it's entirely fitting and quite the contemplative way to have a birthday. So you won't be hearing from me again for about two weeks! I thought about getting all prolific (as much as my almost 29 years of "worldy" experience will allow) and creating some sort of list about all of the things I learned in my 28th year (Do lots of yoga, lean on your friends, it's okay to physically remove yourself from uncomfortable situations, travel all the time despite any obscenities your bank account shouts at you, don't start watching House of Cards unless you hope to see the sun at any point during a 2-week span, etc. ), but I'll spare you all. It's been a year of ups, downs, twists, and turns, and I sure have learned a lot! But more importantly? I've eaten a lot. I'm finally wrapping up my little segment here on the June weekend where my mom and I ate all of the things in Houston. Our final stop was at Down House in the Heights for brunch. DH is a popular brunch spot, so if you go (and you should! ), plan to wait for a little bit. We certainly didn't mind, as we grabbed a couple of bloodies from the bar and stood out front in the suffocating warm Houston air! When I lived in NYC, out of habit I would always order my bloodies extra spicy. After moving back to Houston I learned very quickly that ordering a bloody mary "extra spicy" may actually kill you. So I ordered the Down House brunch bloody as is, and whoa nelly. If I had added the "extra spicy" addendum I would have had to have been hospitalized ("would have had to have been"? I'm dizzy now). 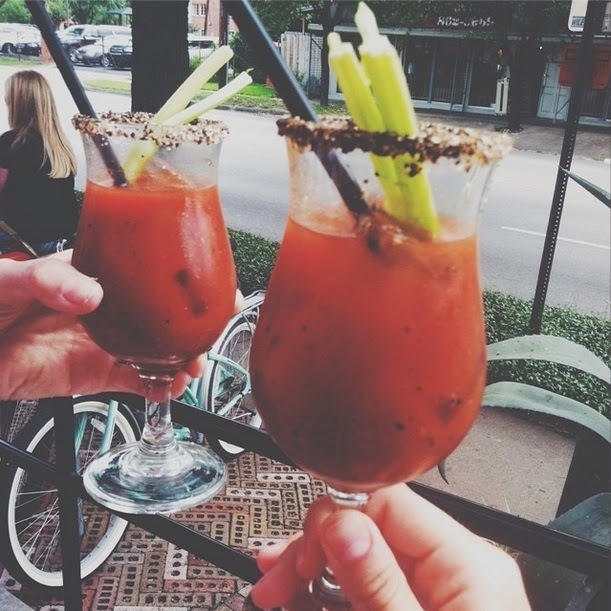 Those bloodies are NO JOKE (but delish). And despite the excruciating mild heat and adorable new world Darwinian interior, my mom and I opted to sit outside. If you've endured six New York winters in recent years, when given the option you choose to be outside for all of the days always forever and ever amen. I'm 78% sure this cocktail was called the Might as Well (seriously, who gave this girl a food blog?). It was super light, refreshing, and citrusy and was by far my favorite drink that I ordered. For my meal I decided on the gouda sandwich. I added an egg and - at the recommendation of my server - avocado, and asked for it on sour dough instead of rye. Superb. Excellent. Outstanding. The melted gouda was so creamy and ethereal, it went perfectly with the tender avocado and egg. And the fries were wonderfully salty and crispy. SO GOOD. My mom ordered this, and I think if I decided to go back to eating non-veg this would be my first meal. GET OUT OF MY FACE CHICKEN AND WAFFLES. Apparently, I've actually learned nothing in the past almost 29 years of my life. But hey, as long as I can eat amazing food and drink amazing drinks at awesome places like Down House with the people I love, I'm one happy camper! Thanks Erika!! The remote location is only for a few days, and then I'm going back to NYC for the rest of the week. July is craze-balls for sure!